1. Using the measurements provided, determine the %slope of the following slopes between Points A and B. 2. 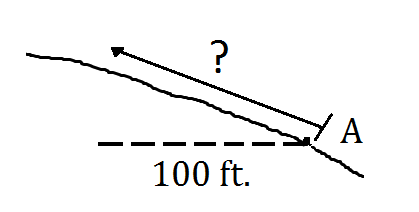 On a 60% slope, Todd wants to walk up a slope a distance equivalent to 100 feet horizontal distance. How far should he walk from Point A? 3. Determine the average slopes between Points A and B on the contour maps below. The scale is 1 inch=2000 feet. The contour interval is 80 feet. 2. On a 60% slope, we know that the rise is 60% of the run. Therefore, the rise here should be 60 percent of 100 feet or 60 feet. Using the Pythagorean theorem, we can solve for the hypotenuse. At left. 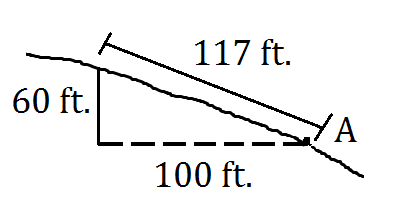 Point A is ≈ 3440 feet. Point B is ≈ 3720 feet. The rise is 280 feet. The run is ≈ 2200 feet. Therefore, the average slope is (280)(100)/2200 = 13%. Next: 2.1 Why Tree Height?